Pavilions and domes feature at The Oberoi Udaivilas, which boasts grand architecture inspired by the palaces of Rajasthan. 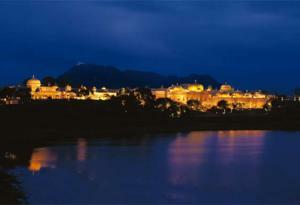 Located on the banks of Udaipur’s Lake Pichola, it has 3 restaurants, 2 heated outdoor pools and a luxurious spa. Courtyards, fountains and gardens occupy the Oberoi Udaivilas Udaipur. Approximately 8 km from Udaipur Railway Station, the 5-star property is a 45-minute drive to Udaipur’s Dabok Airport. Spacious and modern, each room has a seating area by the window. Artworks and rugs decorate the rooms, which are equipped with a flat-screen satellite TV, DVD player and electronic safe. They also include a minibar and marble bathroom. A variety of movies and audio CDs are available for guest to borrow. Practice yoga, learn a Rajasthani folk dance or attend a cooking lesson with the in house chef. Available on request are camel and elephant rides. A more relaxing option is a skikara (wooden boat) ride with wine and canapé. Udaimahal Restaurant specialises in traditional Indian food including Rajasthani and North Indian dishes. Order Western, Mediterranean and Thai food at Suryamahal or enjoy open-air dining with traditional music and dance evening performances at Chandni. 24-hour in-room dinning is also available. Rooms: Hotel Rooms: 87, Hotel Chain: Oberoi Hotels & Resorts. Free! Up to two children under 8 years stay free of charge when using existing beds. There is no capacity for extra beds/cots in the room.